In our last post, Reuben and Ellen shared about their experience being new parents. If you missed that article, you can read it here. I’m really excited for today’s post, not only because Christmas is my favourite time of year, but because joining us today is one of my favourite people in Beijing! When I moved here three years ago in December, I was worried about my first Christmas away from home being a lonely one. However, meeting Rachael at church changed that. She invited me to different get-togethers hosted at her apartment and immediately, I felt like a part of the community. Christmas can be a tough time of year, but it is hard to feel homesick when someone welcomes you the way she does. So Rachael, you have been living in Beijing for quite a while now. Just how many Christmases have you spent here? I have been in Beijing for nine and a half years and have spent eight Christmases here. How did you come to the decision to spend Christmas in China this year? I usually don’t have a choice. The school system here doesn’t revolve around Western holidays, so I get a break at Chinese New Year instead. The company I’m working for now gives us Christmas Day off which is super uncommon and such a blessing. I’m sure you really appreciate it! What kinds of activities do you do to celebrate Christmas here? Rachael and April fight with cookie guns. I’ve found that establishing traditions for myself has helped me enjoy the holiday. My roommates and I always spend time together the week after Thanksgiving putting up decorations while we listen to Christmas music. I host an annual cookie baking party early in the season, so we have a chance to taste some of the traditional sweets from home. My family always made buckeyes so that’s always on the list for the day. The Embassy, which is the young adult fellowship, does a Christmas worship night every year and I’m usually pretty involved in planning it. We incorporate Advent into our worship and its always a special time. The weekend before Christmas, I host a Christmas media marathon. I make a schedule for 15 hours of movies and Christmas specials and people can come and go as they please. I like having nostalgic Christmas get-togethers at my house with old friends and new. I spend Christmas Day rather traditionally. I have some good friends here that have kids and I always spend Christmas with them. I get to be a part of their family and the grandparents know me through the Skype feed. We eat cinnamon rolls, have relish trays, and play games. Your media marathon is one of my favourite Beijing Christmas traditions! Think back to your very first Christmas you spent in Beijing. How did you feel spending it here? Christmas was on a weekday, so I was at the preschool I used to work for. I made gifts for the teachers at the school and the kids, and I sang songs. It was hard to find decorations, but my roommate and I managed to find a little Christmas tree in a grocery store. Popcorn is also easy to find. It felt like a Charlie Brown Christmas. For Christmas Eve, my roommate and I went for hot pot with our teaching assistants. On Christmas Day, the housekeeper of our company took us out for a fancy meal. Food is a big part of the holiday, but it was hard to get excited about Chinese food. It was difficult to make it feel like Christmas since I hadn’t established much of a community at that time, outside of my colleagues. It sounds like you put in a lot of effort to make that season meaningful though. Sometimes it is easier to become discouraged and just not try. Have you ever gone back to your home country for Christmas since moving here? How did it compare? I went home once, and it was great to see my family and friends, but it was really limiting too. Two of my siblings and my mom have birthdays around Christmas so it was really special to spend that time with them. A family in our home church does an annual Christmas bunch and the whole church comes by. It is one of my favourite things in the world and has inspired me to welcome people into my home at Christmas. In Montana in the United States, the winters are hard and it’s not always safe or possible to get out and see friends. After the initial holiday I was snowed in and spent a lot of time with our dog while everyone else was at work. I would almost attack them for some social time when they got home. I missed being able to get around during the holidays. I often think it’s hard to get around in Beijing because of traffic, but I guess it’s a different situation when you’re snowed in! The church community here is made up of people from different denominations. How does Christmas at church here differ from Christmas at your church in your home country? I think the most noticeable differences have to do with music and food. We incorporate many different languages into the worship and carols. I especially like Joy to the World sung in all the languages. The potlucks are interesting and usually have a lot of Asian dishes. What would be some advice to those spending Christmas in Beijing? Especially if it is their first time spending it here? You’ll probably be working on the holiday so decide when you are going to celebrate and make it special. Traditions are how I connect to Christmas so try to find something that really means Christmas to you from home and find a way to share that with someone here. It might just be watching your favorite Christmas movies or making your favorite treats. A big part of the holidays for me is the music so I play it all through December. What about those of us, myself included, spending Christmas here but already have community to celebrate with? How can we be hospitable to those who are new to Beijing or whose friends are all leaving for Christmas? Keep you ears open and make space for the people with nowhere to go. A lot of people leave for the holidays, so it can be easier to open up your circle of friends and meet someone new. Think about how you could add one more person to your guest list. And unfortunately, there are a lot of people in Beijing who haven’t found community yet. Many of them are people we work with. Does your workplace celebrate Christmas? Yes, we have parties, decorate, and the kids get really excited. We have a Christmas talent show instead of a pageant. All the parents prepare acts with their kids and perform together. Then we have a big potluck lunch together. Last year a bunch of families got together and did a little nativity play. They made all their own costumes and their kids were angels and the star. It was so adorable. I’m sure it was! 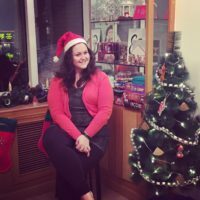 What are some ways we can bring Christmas to work if we are in a very secular work environment? Rachael’s first Christmas in Beijing. In a secular teaching environment, I try to put emphasis on what all the symbols of the holiday mean. I explain that we give gifts because the wise men gave Jesus gifts and we put a star on the tree because of the star that led the wise men to Jesus. I share the candy cane story and explain what Christmas songs refer to. I also give Christmas cards. I write something personal to each person and give it to him or her with some cookies. I want to make sure the people around me know I care about them and include them in my celebration of Christmas. It can open up opportunities for sharing and even bringing someone to a celebration. With eight Christmases in Beijing, you must have some really unique stories! What are some of your best Beijing Christmas memories? A few years ago, my roommate got married the weekend before Christmas. It was a special gift to be a part of her and her husband’s celebration. It made for a hectic but wonderful December. Another great memory is from my time with the family I spend Christmas with. The parents got a rock-climbing wall and set it up in their kids’ playroom. Tracy, the mom, had wrapped some of the extra “rocks” as gifts for the kids with scavenger hunt riddles as to what they were for. The kids had to try and guess as they were led around the house. The big reveal was so exciting. Needless to say, they loved it. Amazing! Well, Rachael, thanks so much for sharing today. I’m sure you motivated many readers to extend an invitation to someone they know, share a Christmas tradition at work, or try their hand at making buck-eyes! Christmas Eve Service in Beijing! If you have a special Beijing Christmas tradition that you’d like to share, please do so in the comments below!